If you have acne prone skin, you'll probably want to be in the know about The Body Shop Tea Tree Oil Collection. All of the products in this line are formulated to help clear up blemishes ASAP. And I'm here to tell you that they WORK. One of my all-time favorite products is the Tea Tree Oil Face Mask, which I like to use as a spot treatment while I sleep -- and, when I wake up? No pimples! 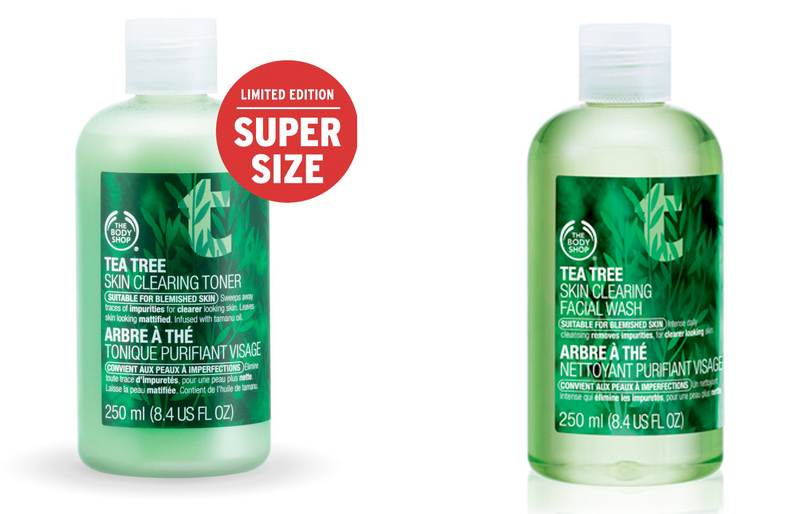 And to celebrate Tea Tree Oil's 20th anniversary, The Body Shop has created jumbo sizes of some of the products. Tea Tree Skin Clearing Face Wash and Tea Tree Skin Clearing Face Toner have been crafted in limited edition super sizes so you have even more of these acne-fighting products at your disposal. One lucky winner has the chance to win both of these products today! This giveaway has a retail value of $36. To enter, use the Rafflecopter widget below. Good luck! Most of the time, twice a day. Sometimes I'm bad and don't wash my face at night! With oily acne-prone skin, in the summer especially, i'm a twice a day-er. And maybe even another tone up after getting sweaty in the humidity. I wash my face once a day. I wash my face twice a day! Usually twice a day, unless I'm home all day...then I'll do morning only.